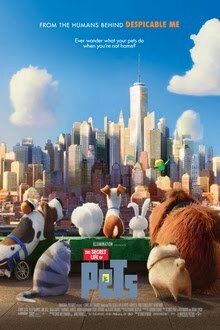 Our Friday night movie for the kiddos, we exercised our parental veto over Little Man (who wanted to watch Big Hero Six for the 1,432,345th time) to sit down and watch The Secret Life of Pets and while it wasn't the greatest movie I've ever seen, it was an entertaining way to pass our night and I honestly enjoyed this movie. The basic premise of the movie: what do our pets get up to while we're away at work on at the grocery story or the like? Turns out, quite a bit. Max is a Jack Russell Terrier who lives with his owner Katie in a Manhattan apartment, while she's at work, he hangs out with the other pets in the buildings- a cat named Chlore, a pug named Mel, a dachshund named Buddy and a bird named Sweatpea- it's a pretty good life that gets turned upside down when Katie decides to adopt another dog from the shelter named Duke. Jealous, Max attempts to mess with Duke to put him in his place, but Duke it turns out has other plans and tries to abandon Max in an alleyway- but they're both attacked by cats led by a Sphynx named Ozone. They take both dog's collars and they're caught by animal control. Duke reveals that if he goes back to the pound, he's going to be put down. They get sprung from animal control by a rabbit named Snowball, who turns out to be the leader of a gang/possible revolutionary organization named 'The Flushed Pets' and takes them to the sewers to introduce them to the rest of the gang and invites them both to join, but before they can, the cats show up and reveal that they are the domesticated pets they had just chased away in the alley- the gang turns on Max and Duke and they barely get away. Meanwhile, Gidget, a Pomeranian from the next building over who has a crush on Max, realizes that he is missing an enlists the other pets and a red-tailed hawk named Tiberius to go and look for them. Max and Duke end up in Brooklyn and visit Duke's old home before getting captured once again by Animal Control- Duke interferes long enough to get Max free and eventually, Snowball and his gang and Gidget and her gang catches up to Max and Duke and eventually, they all get home safe and in one piece- best friends together with their owner, Katie. As kids movies go, this wasn't bad. It wasn't the greatest kids movie I've ever seen either, but it was entertaining enough. The premise was cute- I like the character of Leonard- a prim and proper poodle who turns on his death metal as soon as his owner walks out of the door. What took me aback was the cast: Louis CK, Eric Stonestreet, Kevin Hart, Jenny Slate, Ellie Kemper, Lake Bell, Dana Carvey, Hannibal Buress, Bobby Moynihan, Steve Coogan, Albert Brooks- it's an impressive list.